In this ancient, nearly forgotten, tradition, study is the site of educa- tion. Not instruction, not learning, but study constitutes the process of education, a view, McClintock (1971, 167) tells us, grounded in “indi- viduality,” “autonomy,” and “creativity.” (The three are, of course, in- ter-related.) Again sounding like the early Sartre, McClintock (1971, 167) emphasizes the significance of our “particularity,” that we become more than we have been influenced to be, that we (here he anticipates Rorty) refashion ourselves by engaging “freely” and “creatively” our circumstances. Such a statement recalls certain strands of the progressive tradition, although not its confidence that we can teach freedom for creativity, let alone for individuality and autonomy. Rather, from the point of view of study, self-formation follows from our individual appropriation of what is around us; this capacity for selection, for focus, for judgement, McClintock suggests, is the great mystery to be solved (1971, 167). This is, I submit, the mystery that autobiography purports not to solve, but to portray and complicate (Pinar, 1994). A micro review of two articles: Biesta, G. & Miedema S. (1996) and Waks, L.J. (2013). For this week’s readings, I was beginning to think more and more about how the ideas behind progressivism (i.e. pragmatism, and philosophy of education in the early 20th century more generally) impacted the social and political world at that time. I think the most obvious bridge between a conception of progressivism as a set of ideas or ideologies and progressivism as a social and political structure and force in the world is the lives of philosophers themselves, and the histories of their molding societal institutions on the basis of the ideas that they held so dear. Thus, my focus this week on two articles which purport to more closely examine the effect of John Dewey’s ideas on the political realities of his time. Incidentally, what I have just described could be glossed as the intellectual history of progressivism. And I have written at some length about intellectual history as a specific sub-discipline of the study of the history of education elsewhere. Leonard Waks approaches the intellectual history of progressivism from the point of view of a specific text—namely John Dewey’s The School and Society (1899), while Biesta and Miedema’s piece is a broader overview, through three case studies, of Dewey’s influence in Europe, where he travelled fairly extensively in the last half of his life. I want to say right off the bat that I think overall, Biesta and Miedema’s piece was much more comprehensive and useful within the boundaries it set for itself than Waks’. However, in a sense, this is comparing apples with oranges because these two articles set out to do two very different tasks. Biesta and Miedema dissected the influence of Dewey’s philosophy of education in three specific contexts in Europe—Russia, Turkey and the Netherlands. 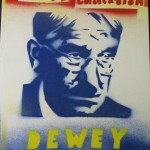 They found that Dewey’s philosophy of education had varying degrees of popularity and success in terms of its adoption. But the reasons they gave and analysis of these relative successes and failures of Dewey’s philosophical influence abroad, make this piece a most interesting contribution to my understanding of the intellectual history of education. Biesta and Miedema found that, despite Dewey’s latter day image as a beacon of western (transatlantic, western European and North American) liberalism, that his ideas actually had the most influence in Russia and Turkey where there were major reform efforts (and later a revolution in Russia) underway. I was surprised to learn that Vladimir Lenin’s wife, Nadezhda Krupskaya, who was deputy minister of education in the U.S.S.R. in the 1920s and 1930s, was very much a fan of Dewey’s work. But it seems that the mainstream opinion of Dewey’s educational philosophy in Soviet Russia began to sour during Stalin’s regime. This is partly, as Biesta and Miedema suggest, due to Dewey’s support of Trotsky. Given Dewey’s status as a icon of American liberalism, his relatively close link with the burgeoning soviet education system immediately after the revolution is surprising to say the least. As they do throughout this piece, Biesta and Miedema brilliantly analyze Dewey’s influence. As in this case, Dewey’s philosophy could be integrated into the Soviet education system on a practical level internal to pedagogy, with less quibbling about his underlying liberalism, America-centrism or his discomfort with Marxism. The authors found, perhaps ironically, as they say, that Dewey’s philosophy ended up having the weakest influence in the Netherlands—the jurisdiction they identify as being most similar ideologically to Dewey’s home turf in the United States. Nevertheless, the possible explanation Biesta and Miedema offer for Dewey’s philosophy’s failure to take hold in that liberal Western European nation still operates along the same lines as their analysis of Dewey’s influence in Turkey and later in Russia. In short, Biesta and Miedema want to treat Dewey’s philosophy as a multi-faceted thing, complex not only in its origins in Dewey’s biography as a scholar, teacher and activist, but also in its interpretations and indeed misinterpretations around the world. I’m doing Waks a bit of a disservice by cutting my analysis short here. But time is of the essence at the moment, so I will leave my criticism at this: where Biesta and Miedema capture a lot of the complexity of the system of ideas and political realites which was progressivism in education in the first quarter of the 20th century, Waks’ picture of this movement and of the philosophy behind it is very flat. Part of this, as I mentioned at the beginning of this review has to do with how Waks structured his piece—first around a single text of Dewey’s, The School and Society, and then in a sort of diachronic sort of way of analyzing the “then” and the “now” of American education reform. This diachronic approach, which theoretically emphasizes the changes that occur from one period to another is over-simple, and I think does a disservice to the complexity and importance of the ideas Dewey was struggling with during his lifetime. That is not to say that the problems of the present day in education are unimportant in light of the past. However, it makes it a little to easy for an author to use the figure of Dewey as a stand in or booster for some contemporary ideology, which truthfully there is no way of telling whether Dewey would support or not. So, for example, in Waks’ discussion of “occupations” in education—those “focal points of school learning”—that were so critical to the popular expression of Dewey’s progressivism in American schools (think vocational education), he gets a little carried away by the resonance that these ideas have with current trends in educational practice. Here Waks gushes that occupations are, “natural bridges linking children as given by Nature to children as enduring educational aims prescribe they should become” (p.75). Setting aside that Dewey spoke out constantly against prescribing any “enduring educational aims” for children, this is an instance of the oversimplification I’m trying to get at. It is not enough to simply cut and paste ideas like “occupation” across contexts. Sure Dewey’s jargon is vague sometimes. And perhaps because of this vagueness his philosophy invites these kind of cut and paste moves. But Waks fails to show the complexity of the way terms like occupation would have functioned at the turn the 20th century differ from the way they function in the present. Indeed, there is a failure on Waks part to note that even over the course of Dewey’s own lifetime his own ideas and the way he talked and wrote about them changed. Waks is absolutely right to want to bring Dewey’s ideas into the present. But I think he just needs to be more careful about how he accomplishes this goal. As it stands, Waks piece betrays a certain ideological conservatism or at least nostalgia for some fixed and enduring educational aims (perhaps “Progressivism in Education,” writ large) that I don’t think Dewey would have suffered lightly. A reading of The Metaphysics of Pragmatism by Sidney Hook (1927). Photo of Sidney Hook from Wikimedia Commons. I completed this reading with a 1927 hard copy published by The Open Court Publishing Company (Chicago & London); although it should be in the public domain by now, so it would not surprise me to be able to find a reproduction of this relatively short (144pp.) book online. I shall post a link to the ebook here if I am able to find one. But I’ll also quote fairly liberally from the text in my analysis in case web access to the book is ultimately restricted. I first became aware of Sidney Hook by way of Westbrook’s 1992 intellectual history of John Dewey’s career, John Dewey and American Democracy. Westbrook presents Hook as one of many intellectual foils for Dewey. Westbrook’s list of Dewey expanders and detractors includes figures as variously renowned and obscure as Randolph Bourne, Dewey’s student, who opposed the United State’s entry into WWI even as Dewey threw his support behind President Woodrow Wilson, and William James, who was among those Philosophers who wooed Dewey to pragmatism from his early Hegelian idealist days. Pragmatism is, of course, derived from the Greek word for ‘action.’ But Hook, by re-naming it “instrumentalism” emphasizes a different (possibly reciprocal) aspect of human action—namely the “how” of it. Generally speaking, pragmatism proceeds by means of instruments. But going further still, Hook argues that the existence of instruments in the world offers clues to the structure of the world. In his chapter, “The Metaphysics of the Instrument,” Hook demonstrates convincingly that instruments always carry meaning, that they exist either a) in reference to some object, b) for some domain-specific application or c) in respect and because of its form, arrangement or structure. These references generate a number of relations highly interesting for philosophical analysis. They show that nature instrumentalized is nature, so to speak, grown or brought to self-consciousness (p.19). An instrument is a monument to a felt lack in existence. But it is more. It is a promise of its eventual check and elimination. This is Dewey at his best in my opinion. It is also Dewey at his most post-structural, especially as he pushes his readers towards a metaphysics of pragmatism sous rature (under erasure) or as Jacques Derrida might have it, Dewey’s and Hook’s is a metaphysics of pragmatism. Hook is definitely most comfortable with the pragmatism of Dewey and Peirce, which he says is more concerned with the social and political world, as opposed to the “personal and consolatory” pragmatism of Schiller or the “nominalistic” pragmatism of James. I frankly have not read enough of these other philosophers to know what Hook means with these epithets. But the political kernel of Dewey’s pragmatism is clearly what Hook is most comfortable with and wants to build from with his metaphysics and the new category, instrumentalism. Another interesting tangent that appears to link pragmatism (as instrumentalism) with other later-20th century developments in Marxist critical theory is the centrality of language and social construction of meaning (=language) and its study (=linguistics, or semiotics more specifically). This is an area of great interest for me. And an area that I devoted some measure of previous study to as an undergraduate linguistics major. Without instruments there can be no objectified meanings… it follows that the existence of certain structural lineaments which condition the possibility and presence of instruments, condition therefore a range of meanings. Where instruments are inapplicable or useless, there meanings can never be found (p.23). It seems like Hook might be making a reductio ad absurdum argument here, because I can’t think of a counter-instance of a situation in which meaning is present without instrument. And Hook’s definition of instrument, as I referenced earlier, is tied directly to its symbolic valence or meaning. Simply put, “Every tool, appliance or artifice recites a lesson on the nature of the world” (p.24). This maxim of instrumentalism, also interestingly operates in parallel to what I’ve heard called in a documentary on WWII code decryption technology, “the first law of cryptology,” that is: every code has its cipher. It’s also another way of looking at the problem Hook glosses elsewhere as the tautological or necessarily circular nature of any system of knowledge. The instrument marks a point at which human interest intersects the natural continuity of the historical process, converting the even flow and existent brutality of natural ends into multiply-implicative foci of rational enterprise. Endings that are natural and causal become ends that are rational and informed (p.26). Instrumentalities can never become transmuted into irrecoverable certainties, for their effective application depends upon definite objective environmental traits as well as upon the passing needs and purposes of those who live and react [interesting choice of words] in that environment (p.30). Every instrumental operation, whether it be scientific or artistic, industrial or personal, implies an order to which it owes its existence and an order in virtue to which its ends are realized. The instrument enables us, by utilizing these natural processes, arrangements and termini which antecede and provoke its existence, to create new ends which they suggest and sometimes compel; and to regard in moments of exuberance, the mechanics of transformation as the magic of mind” (p.38). This is how Hook ends his preliminary discussion of the metaphysics of the instrument. The next chapter comprises an extended discussion of an important particular case of instrumentality: mind. Hook’s consideration of mind—that specific instrumentality which pragmatist philosophers (especially Dewey among them, for whom psychology was of prime importance) have come to ascribe to the dialectic of human subjectivity, is important in its treatment of thought as a phenomenon “that goes on among [objective] things and events” (p.48). All social reform whether undertaken in the name of god, social engineering or revolution presupposes a belief in the instrumental character of social institutions. Reorganization is easiest and most effective when the direction of the change is in line with the natural unfolding and growth of institutional forces [~hegemony?]. An examination of the instrumentalities of economic production for example, suggests to collectivists [~socialists?] a revision and extension of the social ends of current distribution. These readings in terms of economic forces and resultants distinguish them from the Utopians [yet another name for a 1920s political faction I am unfamiliar with], who like the poor, are always with us and in the eyes of those who pride themselves on their social realism, attempt to transform things nearer their hearts’ desire by the incantation of democratic shibboleths and by philanthropic exhortation rather than by class organization and struggle (p.61). So, Hook, here is getting on board with Dewey’s conception of pragmatism as political philosophy. But this section also sounds a certain note of criticism of Dewey, especially perhaps his hawkishness a decade earlier during WWI. Dewey’s magic word was always “democracy.” So, perhaps Hook’s barb (no pun intended) here may actually be aimed at least in part at the older generation of pragmatist philosophers. Another example from collectivist theory to show how the desire to widen the interest of a political or social instrument may lead to its abolition, is illustrated in the conception of the state. The state regarded as the executive committee of the ruling class, capitalist or proletarian, will in Engel’s phrase ‘wither away’ when economic classes are abolished and will be replaced by more voluntary forms of organization. So long, then, as ethics pays attention to ways and means, instruments and agencies, it is intimately linked with social philosophy. “Although instruments have often been the means of man’s enslavement, construed as they appear in their social setting they breathe a promise that they will make him free” (ibid.). Hook, who was avowedly a socialist (or collectivist perhaps) himself, according to Westbrook could not have anticipated the deformed bureaucratic state that would emerge out of Stalinism. So, it is best perhaps to excuse his faith in Engels’ words as an instrument of revolution, just as Dewey’s earlier exhortations about democracy should be considered as at least in some respects detached from the political realities and contemporaneous rhetoric of the United States as an instrument of “democracy” and its attendant ideologies. Hook’s beliefs about socialism were well informed to say the least, but I think he would argue in retrospect, that his beliefs as well as the realities they were connected to were all contingent. Hook points to James’ assertion in The Meaning of Truth that “Pragmatism or pluralism has to fall back on a certain ultimate hardihood, a certain willingness to live without assurances or guarantees… on possibilities that are not certainties” (James p.229, quoted in Hook p.87). Our knowledge of the structure or order of nature has been born in a shock, strengthened by a guess, and fixed through a habit. The logic of demonstration is the logic of discovery grown cold” (quoted in Hook p.88). The metaphysical implication of the pragmatic-realist logic of leading principles is an open universe in which there is an element of radical indetermination, in which physical constants are limits of variation and physical laws summations and prognostications of physical flux” (ibid.). A social movement, therefore, must be based not only on a social ideal, although that is a sine qua non, but upon a body of social knowledge. Not only is it true that the world can not be remade in its entirety, it can not even be completely re-thought or re-imagined. If this be questioned, I challenge anyone to see in his mind’s eye a color never beheld in experience before” (pp.99-100). Hook’s position is not completely skeptical of knowledge, but demands a more comprehensive understanding of its sources and structures. A fourth chapter here goes into what Hook calls “categorical analysis,” which on first blush appears to be a kind of phenomenology by another name perhaps. This is probably the least important chapter for my understanding of Hook’s philosophy. It is also the most tentative and unresolved. But in his concluding chapter, “Of Human Freedom,” Hook speaks to a phenomenon that I have previously identified elsewhere as being of central importance to Dewey’s pragmatism and the project of progressivism in education more broadly. Hook begins by paraphrasing Augustine who wrote of the concept of time that, “If no one asks me what it is I know: If I wish to explain it to one that asketh, I know not” (referencing Augustine’s Confessions XI, xiv). Hook goes on to note decisively that freedom is not a question of psychology, seemingly deflecting some potential criticism from a proto-behaviorist readership. Rather, Hook makes an interesting move, referencing Aristotle’s Nicomachean Ethics, where Aristotle parses the possible limitations to freedom as 1) the physical compulsion of some external force, or 2) ignorance of the circumstances in which an act is performed. If I’m not mistaken, Dewey makes reference to these limits to freedom in his 1938 lecture that became the book, Experience and Education, which I have analyzed elsewhere for a different course in the “Ignorance Log” portion of this blog. Knowledge, then, of ourselves and of the world without is the key to freedom for it tells us what we are and that we can be no other than what we are. Freedom is the consequence of this knowledge revealed and attested to by our everyday activities” (p.140). Here Hook with Hegel makes a leap to Adam in Eden, who arguably was not completely free until he ate the fruit of the Tree of the Knowledge of Good and Evil. Although human freedom depends upon a natural order, the natural order does not determine or confer upon itself significance. That is to say, the values which arise in the possession and exercise of freedom can never be derived from the order of the domain in which that freedom is a fact. So, in similar fashion to the way in which knowledge systems are necessarily tautological, Hook notes that freedom’s existence is its own kind of a self-completing circle. Just as Thomas Jefferson and the other founders of the political entity that became the United States of America recognized when they wrote that “certain inalienable rights” had been conferred upon all people by God, Hook seems to be saying that freedom is never completely “man-made.” More to the point, it is a similar move to the Audre Lorde epigram that became Arendt’s book title: The master’s tools will never dismantle the master’s house.” I’m misquoting or misattributing that somehow I’m sure. But above, all, Hook’s conclusion with the possibility of freedom is true not only to his forebears’ pragmatism, but I think also pushes the envelope on their interpretations. His phenomenology of instruments—if it can be called that— is ingenious. I think I ultimately have to agree with Westbrook’s characterization of Hook’s oeuvre—at least in the case of his Metaphysics—holds true. instrumentalism is a welcome bridge between pragmatism and its underlying dialecticism. Look for another (probably shorter) entry later on this week, on Dewey and Peirce /pers/ and the social and political directions they took pragmatism (or pragmaticism).